The apparent failure of safer tank cars to prevent an explosion in Monday's West Virginia oil train derailment is worrying the top safety official in Rockland County, where similar trains rumble through daily. No one was hurt when the train hauling 109 cars filled with Bakken crude oil from North Dakota left the tracks during a snowstorm in Mount Carbon, sending a huge fireball into the sky and threatening the local water supply. Hundreds of families were evacuated. CSX said all of the tank cars were CPC 1232 models, which include safety upgrades voluntarily adopted by the industry four years ago, the Federal Railroad Administration confirmed Tuesday. The 1232s are supposed to be safer than the older DOT-111 tankers, which the federal government is seeking to phase out because they have been found to be vulnerable to ripping open in an accident or derailment, resulting in fires and explosions. Gordon Wren Jr., Rockland's Fire and Emergency Service director, said it was "worrisome" that the purportedly tougher tank cars failed. "Even with the better tank cars, accidents will still happen and they can still fail. You're talking about tremendous weight and energy," Wren said, adding that oil companies should pay for the best available technology to minimize risks to local communities. About 25 tankers derailed, with several cars ruptured or with valve leaks, CSX said. The cause of the derailment is under investigation. About 15 to 30 oil trains travel weekly through Rockland on CSX's River Line. Each train, which typically has 80 to 100 tank cars, moves at least 1 million gallons of the volatile Bakken crude oil, which contains chemicals that ignite and burn at lower temperatures. Much higher standards are needed to safely move oil by rail, said Sean Dixon, staff attorney with the environmental group Riverkeeper, noting that a Canadian National Railways train carrying oil derailed in rural Ontario on Saturday night. "Each of these tank cars can lead to a disaster in an almost infinite number of scenarios," Dixon told The Journal News on Tuesday. Riverkeeper has called for tank cars with thicker shells, better brakes and rollover protection to "mitigate the extent of a disaster," Dixon said. But to prevent one, he said oil trains should not be allowed to run alongside waterways that supply drinking water, or through populated areas. The U.S. Transportation Department this month sent new rules about the DOT-111 tankers to the federal Office of Management and Budget, which offers the last word before the rule takes effect. The DOT considered different shell thickness options, among other safety features, for both the CPC 1232 and DOT-111 cars but that information won't be made public until the rule is finalized. Both U.S. Sen. Charles Schumer, D-NY, and U.S. Rep. Sean Patrick Maloney, D-Cold Spring, have urged the OMB to finalize the regulations as soon as possible. "If we're serious about safety, we needed these critical commonsense technology improvements yesterday," Maloney said Tuesday in a statement. Said Schumer: "This accident shows the serious danger of transporting crude oil by rail, and that improving safety has to be the number one priority." The CPC 1232 tankers have been involved in other high-profile accidents. In April, a 105-car CSX oil train derailed in Lynchburg, Virginia. 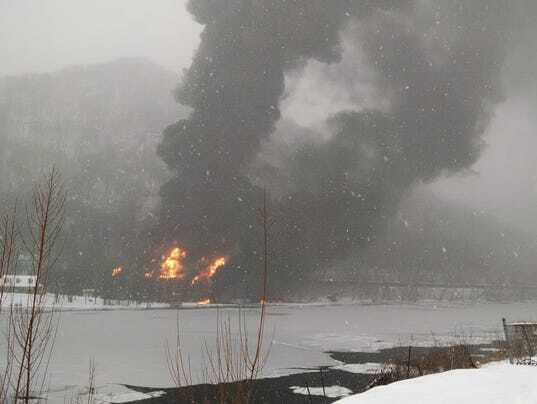 Several of the 17 tank cars that went off the track and fell into the James River were 1232s, including one that spilled about 30,000 gallons of Bakken crude, causing a massive fire. Next week, a fire chief who responded to one of the worst rail disasters in recent memory will speak to first responders and elected officials in Rockland. Tim Pellerin of the Rangeley Fire and Rescue Department in Maine was in Lac-Megantic, Quebec, following the explosion of several tank cars in the town's center on July 6, 2013. The accident killed 47 people and destroyed more than 30 buildings, resulting in $800 million in damage. "There's nothing better than learning from what went right and what wrong in a large-scale or complicated emergency," Wren said. More than 100 firefighters from Rockland, New Jersey, and upstate New York are expected to attend the Feb. 28 seminar at the Rockland Fire Training Center in Ramapo. Pellerin will speak to elected officials for 90 minutes a day earlier, on Feb. 27, and share photos and video footage from that day. Rockland officials also are "fine-tuning" an evacuation map along the River Line in case of a similar oil train emergency, Wren said.